If you’re in need of store-it-yourself solutions, consider mobile storage in Orlando from the experts at AAA Insta-Move. Our storage containers are of the highest-quality and can keep your belongings safe and secure for as long as you require. Pack your items yourself or opt for our full-service packing solutions. Our Orlando mobile storage company can deliver a container to your home or office and pick it up once you’re done. We can also store your mobile container off-site or leave it with you for easy access. Look no further for high-quality mobile storage services than AAA Insta-Move. We proudly maintain a 17,000 sq. ft. facility that operates above and beyond the standards of the industry. Our warehouse is equipped with sprinklers and camera systems to ensure fire and theft protection 24/7. We also incorporate a storage information system to keep track of exactly where your mobile storage container is placed for a flexible storage solution that meets your needs and budget. Since 1997, our Orlando mobile storage company has been dedicated to making the storage of your household and commercial items a stress-free experience. You can count on our professionals to work with you to create a streamlined storage plan that can accommodate your needs. If you’re ready to get started, call AAA Insta-Move today to get in touch with our experts. You can also fill out our online form for your free, no-obligation moving estimate! Why choose Mobile Storage Containers Orlando? When you need to store some of your belongings, you have to load everything on to a truck, drive to the storage facility, and unload it. That’s a lot of work, and it’s easy to use up an entire day moving things to storage. Fortunately, there is a better way. AAA Insta-Move’s COWs mobile storage provides a convenient and affordable way to handle all of your moving and storage needs. Whether you’re moving, need to empty a room for a renovation, or want to declutter, COWs (Container on Wheels) makes it simple! If you’ve never tried mobile storage Orlando before, you’ll be impressed with how easy they are to use. 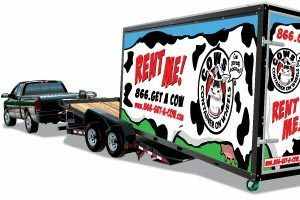 Simply give us a call, and we’ll deliver appropriately-sized COWs to your home or business. From there you can either fill it yourself at your convenience or do some of the moving and have us help you with the heavy lifting! The moving containers can be stored at your home or business or kept safe and sound in our secure facility. If we store the COWs, we’ll deliver the container right to your door whenever you’re ready! AAA Insta-Move offers both short-term and long-term storage. If you’re moving, we’ll transport your COWs anywhere in the country! Load the container at your convenience. Take your time over several days or longer—there is no rush when you use COWs! When should you choose portable storage containers over the traditional moving truck? Are you preparing for the move? Do you have a dilemma which type of transportation to use for your upcoming move? Well, you are in the right place. Getting a mobile storage Orlando with AAA Insta- Move is an affordable and most efficient way to relocate and store your belongings. When you calculate all the moving costs, soon you will see our mobile storage containers are the best option for a successful relocation. Why is it better to choose portable storage containers over the traditional moving truck? Usually, the moving cost depends on the number of the things you need to relocate. In case you have a lot of items to transport, you need to use a moving truck several times which can cost you a lot. That’s why getting mobile storage is the best way to save some money. They are bigger, and they are a perfect fit for more items. Also, if you have large, heavy and bulky items to transport, it is a smart decision to use portable storage containers for its transport. For example, if you are relocating the piano, in the moving truck you can transport only this one instrument. With mobile storage besides piano you can relocate other items at once. To conclude, renting a mobile storage is great solution because the move is easier and the costs are lower! Renting such a container usually is more expensive than renting a truck. But, with our portable storage containers, it is cheaper than hiring a professional moving company to handle your relocation. If you want to relocate across Orlando, mobile storage is the best way to do it without breaking the bank. Our mobile storage containers are more and more popular. You can choose the right size for the affordable price. So, if you are planning a move soon, make sure you consider renting mobile storage from our Orlando moving company. Our mobile storage container is your way to go! We ensure you that your belongings are with our portable storage containers. You can load it, lock it knowing your items are safe until comes time to unload the mobile container. Containers are made from tough steel and they are waterproof. So, there is no chance something can damage your items inside. Are you remodeling your home? Or relocating your business? Our portable storage containers are your perfect choice! Feel like unwanted furniture and equipment are taking over your office? Tired of making your way around seasonal boxes that are taking up tons of space in the basement? Or maybe you’re trying to declutter a bit in anticipation of selling your home? There are countless reasons why portable storage in Orlando, FL from AAA Insta-Move can make your life easier and more comfortable! Perhaps you’re remodeling your home and need a safe space to temporarily store your furniture on-site. Or maybe you’re looking for a secure DIY storage option for your business. No matter your reasons for portable storage in Orlando, look no further than AAA Insta-Move as your premier Orlando portable storage company. We proudly offer flexible storage solutions that can accommodate even the largest storage need and the smallest budget. Don’t settle for anything less than secure storage that can keep your important belongings safe at your home, at your office, or in our facility. Our professional storage experts make it easy to store on the go and at your own pace. Since our founding in 1997, we’ve completed thousands of successful storage projects, keeping the belongings of our customers safe and sound until they are ready to be picked up or received. Our crew offers portable storage in Florida that is perfect for residential and commercial customers. With short- and long-term options, we have a storage solution that’s perfect for you. If you’re ready to get started on your portable storage in Orlando, call AAA Insta-Move today or fill out our online form for your free, no-obligation moving estimate! Be the part of AAA Insta-Move family! No other kind of storage is more convenient than portable storage containers, especially when you choose the containers from our Orlando portable storage company. You don’t have to worry about renting a truck to transport your items, loading up your stuff yourself, or unloading it at our facility. With the portable storage options from AAA Insta-Move, we do all the hard work for you! You can count on convenient and portable storage options for everyone. Our network of satisfied clients is growing every day. Everyone is satisfied with our services. Rent our mobile storage and become a part of the AAA Insta-Move Family! Get an Exact Quote On Portable Storage Today! Since 1997, AAA Insta-Move has provided quality, customer-focused service. That commitment to customer satisfaction has earned us A+ accreditation with the Better Business Bureau, and ProMover certification with the American Moving and Storage Association. Those affiliations mean that you can trust us with all of your moving and storage needs! Next time you need to move or store some things, make light work of the task with COWs mobile storage! With so many flexible storage options, you can bet that our Orlando moving company offers flexible pricing too. Just give us an idea of your needs and your budget and we’ll provide you with an exact quote on the storage you need. Fill out our form or give us a call today!